This newly listed home was built in 2008. It has three bedrooms, one and a half baths, and sits on eight acres of land in the coveted Rossville School District. The listing price is $ 167,000. This house has beautiful natural lighting in the kitchen, a scenic pond and a fire pit, outbuildings, woods, and a garage with a full bathroom, which is currently being used as a workshop, but could easily be an In-Law Suite, said Cunningham, a Realtor for RE/MAX Ability Plus. Enjoy a pleasant cross breeze in the main house to keep you cool in the summer, while radiant heat will toast your toes in the winter, Cunningham said, before adding, Be sure to bring your fishing pole for the pond. Come see this special house and beautiful land today and get moved before school starts. An additional three acres are available for future negotiations. 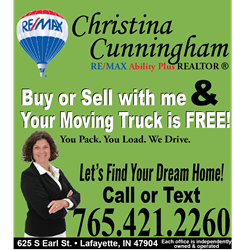 As to why anyone in the buying and or selling market, should use Cunninghams services, she stressed that, above and beyond is the only service that she provides for her buyers and sellers.In addition, Cunningham equips buyers with her complimentary 17 foot moving truck to help them move in once the perfect house has been chosen and the sale completed. In order to best promote my listings I advertise at a minimum of 900 different websites, Cunningham noted. My goal is to get their homes sold as quickly as possible, for a value that is acceptable to both buyers and sellers while keeping in consideration the current market. Cunningham said she believes communication is important any relationship. One simple way I exhibit the level of commitment, that I strongly believe should be given to every seller, is I send my sellers weekly updates so they can see how many people have viewed their homes, due to the high level of marketing that I do, Cunningham said. As for buyers, Cunningham said, she works with buyers anywhere from one week to two years. It is more important for me to know in my heart that my buyers have found the right home, and not just four walls that work, Cunningham said. Full service is the only way I know how to help my clients. If a buyer needs help with finding a suitable lender, I help with that. If a client needs help with finding a handy person to help with a few household chores, either before selling or after buying, I help with that, as well. Basically, if a client has a need for something, I try to provide a great solution. With every transaction (both buyers and sellers) that closes, a donation is made on the client’s behalf to Children’s Miracle Network and/or Almost Home Humane Society. Christina Cunningham works with both buyers and sellers. Whether buying or selling, her clients are welcome to use her complimentary moving truck for 48 hours. For more information, please call (765) 421-2260. This entry was posted in Mobile LED Trucks and tagged Charming, Christina, Cunningham, District, Highlights, Home, Realtor, Rossville, School on July 23, 2015 by MobileLEDTrucks.